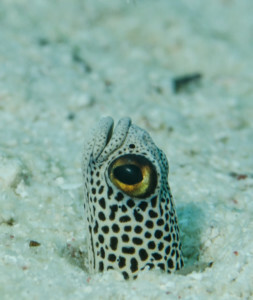 Every diver usually remembers their first garden eel encounter. You are swimming near the edge of the reef, over the sandy bottom, and you see a grassy area at the limit of your vision. As you move closer to the grass, it begins to shrink and eventually disappear! It turns out it is not vegetation at all, but garden eels! These animals use their rigid tail-tip to dig a burrow in the sand. They exude lots of mucus from the skin that helps cement the sand grains together so the burrow walls become stable. If danger approaches, they withdraw into their burrows, but when the potential threat disappears, the garden eels reappear. They stretch out from their refuges to snag zooplankton (tiny animals like animal larvae, tiny crustaceans and eggs of various reef animals) that are pushed past in the current. Because they rely on water motion to bring food to them, the garden eels typically live in current prone habitats. 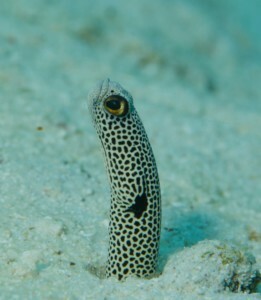 Some of the garden eels live in big groups, but the spotted garden eel is more often found in smaller colonies or even singly. They are usually hard to photograph because they retract in their burrows before you can get close enough to get a great shot. But if you are really patient, and slowly move toward a spotted garden eel (or if you are lucky enough to find a dumb individual!) you will be able to get good photos of this handsome eel.